Blue Forest were asked to design a modern children’s play house to fit in with an initial concept design. 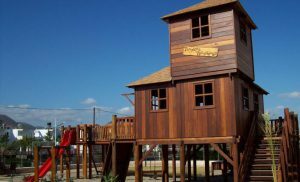 The main play structure consists pf a small play house, intertwined with a tunnel maze over 2 floors. Timber ladders provide access through hatches in the floor. The tunnel maze leads to a ball pit with a climbing wall and bell for the adventurous climber to sound victory once at the top. Openings in the clad walls of the playhouse provide a safe place for adults to observe if required. A further tunnel from the 2nd floor exits the playhouse onto a timber platform where you then climb onto a slide and slide down to the lower level. A giant platform swing has been positioned at the front of the playhouse, cantilevered from one of the Oak rafters of the pergola. This swing has great play value as well as a fantastic place to relax and look over the garden. Hidden in a small nook of the garden at the end of the Oak pergola, is a hanging day bed. This provides a relaxing space, although feeling separate from the play structure, allows the 2 structures to sit harmoniously together, with the use of a grid formed by the pergola structure. We have created an elegant, modern structure that everyone can enjoy, and that fits in beautifully within the client’s garden, ensuring the children will be kept well entertained while the adults enjoy quality time outdoors. Tanglewood Tree House features three different decks, and a "crow's nest" lookout. The house is meant for parents to relax in, while the children play and move around on the decks, thanks to an access through rope bridges.